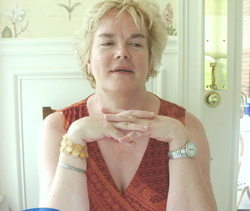 Susan Grimm is the author of Almost Home (Cleveland State University Poetry Center 1997), Lake Erie Blue (BkMk Press 2004), and Roughed Up by the Sun’s Mothering Tongue (Finishing Line Press 2011). Her work has appeared in Blackbird, The Journal, The Cortland Review, Seneca Review, and Tar River Poetry. She earned an MFA in poetry through the Northeast Ohio MFA consortium (NEOMFA) and teaches creative writing part-time at the Cleveland Institute of Art. She also occasionally teaches classes for Literary Cleveland. She lives in Cleveland, Ohio, and can be found online at The White Space Inside the Poem.